Cycle of the Werewolf is a short horror novel by American writer Stephen King, featuring illustrations by comic-book artist Bernie Wrightson. Each chapter is a short story unto itself. It tells the story of a werewolf haunting a small town as the moon turns full once every month. It was published as a limited-edition hardcover in 1983 by Land of Enchantment, and in 1985 as a mass-market trade paperback by Signet. King also wrote the screenplay for its film adaptation, Silver Bullet (1985). The book is dedicated to the author Davis Grubb: "In memory of Davis Grubb, and all the voices of Glory." Marty Coslaw is a 10-year-old paraplegic, he serves as the novella’s protagonist. He hears the werewolf howling in March and is attacked by the beast in July, where he blinds it in one eye with a package of Black Cat firecrackers. He discovers the identity of the creature to be Reverend Lester Lowe in October and kills him with a silver bullet in December. Marty’s mother, she tries to treat him as if he were no different from any other 10-year-old boy. Marty’s father, he is uncomfortable interacting with his disabled son, speaking to him in a patronizing voice (called the Big Pal voice by Marty). He is the coach at Tarker’s Mills High School. Marty’s 14-year-old sister, she seems jealous of all the attention Marty gets throughout much of the novella. Marty’s paternal grandfather, he lives with the family. Marty has a good relationship with his grandfather, who is described as being the typical grandfather. He is noted for being a heavy sleeper. Marty’s wild-living maternal uncle, he always seems to be in the doghouse with his sister. Al treats Marty better than anyone else in the story, and buys him the fireworks Marty uses to blind the werewolf in one eye after the Fourth of July fireworks are cancelled. He also supplies Marty with the silver bullets and the gun he uses to kill the beast in December. Reverend Lester Lowe, the werewolf, is first mentioned in the story in April, preaching a sermon about the coming of spring. Around May, he has a dream in which his entire congregation—and then himself—transforms into werewolves before he awakens. The next morning, he finds Clyde Corliss, a custodian, dead on the pulpit at his church. He is seen as a pillar of the community and has been viewed that way for years, coming to call Tarker’s Mills home. Lowe has not been a werewolf his entire life, nor has he been a werewolf since he first arrived in Tarker’s Mills. In fact, he has no idea about how he became a werewolf, but he suspects that it has something to do with some flowers he picked at a cemetery on Sunshine Hill months prior to his first transformation. He went to put them in vases at the church vestry, but they turned black and died before he could finish the relatively quick job. He has no reason to pinpoint this event as the beginning of his curse, but he believes that this was the beginning of the events. As the werewolf, he serves as the primary antagonist of the novella. Lowe comes to realize that he is the werewolf after having awakened with fresh blood on his fingernails and (to his horror) mouth. He also discovers his clothes are missing or sometimes finds scratches and bruises, which appear to have come from running through the woods. The dream in May serves as a further omen to his curse, but he doesn't fully realize his curse until July 5, when he awakens with his left eye blasted out. After Halloween, he began getting anonymous letters from someone who knows his secret, suspecting that it is the person whom he attacked in July and failed to kill, the person who blasted his left eye out. In November, he acknowledges that he is the werewolf and decides that he cannot risk going out in the woods, as he could be killed by the group of vigilantes who had taken to the woods that month. To avoid the vigilantes, he travels to Portland, where he kills Tarker’s Mills resident Milt Sturmfuller outside a cheap motel. After returning home, he decides to find out whom he attacked in July, and confront that person. Marty eventually signs his name to the last letter he sends in December, shortly before the next full moon. Lowe is killed by Marty on New Year’s Eve. Arnie is a railroad employee killed sometime in the wee hours of the morning on New Year’s Day in January. He was snowbound in a blizzard after trying to clear snowdrifts off the tracks which had blocked the trains. Westrum manages to hit the werewolf with a pick axe once before it killed him. Stella is a virginal seamstress whose business is beginning to fail. On Valentine’s Day in February, she sends herself cards from 1980s heartthrobs and longs for a lover. She sees the werewolf watching her from outside her window and lets it in, believing she is dreaming. The werewolf pounces on her and kills Stella in her bed. A drifter killed on St. Patrick’s Day in March, he is found by an employee of the Electric and Gas Company while searching for downed lines. His body is surrounded by wolf prints. Brady Kincaid is an 11-year-old boy killed while flying his kite on April Fool’s Day. He had an expensive kite and stayed out too late as he became fascinated by it. He is found the next day, decapitated and disemboweled in the town park. Corliss is found dead in the Grace Baptist Church by Reverend Lowe on Homecoming Sunday in May. He had done janitorial work at the church since the late 1970s. Knopfler is the owner of the Chat ‘n’ Chew, the town’s only diner. He is killed after high-school graduation in June in his diner. He sees the werewolf transform in front of him before he is killed. Neary is the town constable and is frustrated by his inability to solve the case and by his patronizing treatment by the Maine State Police. Neary reveals that Marty was sent to live with relatives in Stowe, Vermont, after his attack in July. His fellow troopers don't let Neary interview the boy, but allow him to have a copy of the deposition Marty gave to them. In it, Marty describes the werewolf in vivid detail, which both the troopers and Neary ignore, including the fact that the werewolf is now missing his or her left eye in human form. Had they not ignored this fact, they could have apprehended Lowe immediately. Both Neary and the troopers believe Marty is suffering from extreme post-traumatic stress syndrome and that the werewolf is a manifestation by Marty’s psyche as a mental block to the trauma. Neary is killed in August while drinking in his parked truck. Zinneman is a pig farmer who has his entire pen of pigs killed by the werewolf, but manages to avoid being killed himself on Labor Day in September. He sees something indeterminate running into the woods after his last pig dies, but he cannot say who or what it is that he saw. The next day, he discusses the carnage with his brother Pete from two counties away. Pete tells Elmer that he knows that a werewolf is on the loose in Tarker’s Mills, citing the unusual tracks in the mud as evidence. The two decide to begin hunting for the beast in November. Sturmfuller is the town librarian who is shown to physically abuse his wife in March and again in October. He begins an affair in November and starts staying at a hotel in Portland. He's ironically killed by the werewolf while at the hotel in Portland, Lowe having gone there to avoid the vigilante group set up by Zinneman. The story is set in the fictional town of Tarker's Mills, Maine. Each chapter is a month on the calendar. A werewolf is viciously killing local citizens at each full moon, and the otherwise normal town is living in fear. The protagonist of the story is Marty Coslaw, a 10 year-old boy in a wheelchair. The story goes back and forth from the terrifying incidents to Marty's youthful day-to-day life and how the horror affects him. The werewolf's first victim is a drunk railroad worker. Next is a woman in her bedroom contemplating suicide, followed by a hitchhiker, an abusive husband, one of Marty's friends in the city park, a herd of hogs at a local farm, a sheriff's deputy while he sits in his car, and finally the owner of a diner. In July, the town's Independence Day fireworks have been cancelled. This is very upsetting to Marty, who has been looking forward to them all year. Feeling bad for his nephew, Marty's uncle brings him some fireworks, warning Marty to set them off really late so his mother won't find out. While outside enjoying his own private Independence Day celebration, the werewolf attacks Marty, who manages to put out the monster's left eye with a package of firecrackers. The werewolf escapes and police ignore Marty's report because they are looking for a human murderer, not a werewolf. As the summer continues, the bloodshed occurs again every full moon. Fall comes and so does Halloween. To celebrate, Marty goes trick-or-treating with his sister. While out, he sees Reverend Lowe wearing an eyepatch. However, Lowe doesn't recognize Marty, as his face is covered by a Yoda mask. Marty, whose family is Catholic, never attend services at Lowe's church, which is why he didn't work out the werewolf's identity sooner. Over the next few weeks, Marty sends the pastor anonymous letters asking him why he doesn't kill himself and end the terror. In December, he sends the last letter—signed with his name. Unbeknownst to Reverend Lowe, Marty has convinced his somewhat reluctant uncle to have two silver bullets made and to come spend New Year's Eve (which falls on the full moon) with his sister and him. Right before midnight, the werewolf breaks into the house to kill Marty. Marty shoots the werewolf twice with the silver bullets. After the wolf dies, it changes back into Reverend Lowe, much to the shock of everyone present. The novella started out as a calendar by Zavista with illustrations by renowned comic-book artist Bernie Wrightson. Each month featured a drawing by Wrightson complete with a short vignette by King. King found the size of the vignettes, which were both small and extremely limited, to be a problem. King proceeded with a short novel and had it published by Land of Enchantment in 1983, complete with Wrightson’s illustrations. In the author's notes at the back of the novella, King admits to taking liberties with the lunar cycle. For example, if a full moon was on New Year's Day, another one wouldn't occur on Valentine's Day, but these dates are widely recognized in January and February. He explains that this was done to focus the relevant months more clearly in the readers' minds. The novel was adapted into a film, Silver Bullet, in 1985, starring Corey Haim as Marty, Everett McGill as Reverend Lowe, Gary Busey as Marty’s uncle, Megan Follows as Marty’s sister, Terry O'Quinn as the local sheriff, Kent Broadhurst as Brady's father, and James Gammon as Arnie Westrum. The movie received mixed reviews and it has since achieved cult status in the US, after appearing on television regularly. 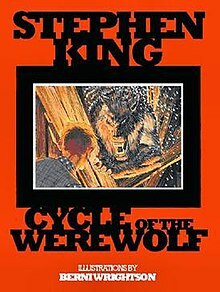 In 1985, Signet Books re-issued Cycle of the Werewolf under the title Silver Bullet in an edition that included King's screenplay alongside the original novella. This edition also includes a foreword by King, recounting the impetus of the novella and the background of the film adaptation. ^ a b George Beahm (1998). Stephen King from A to Z: An Encyclopedia of His Life and Work. p. 109. ISBN 0836269144. ^ Stephen J. Spignesi (2003). The Essential Stephen King. p. 209. ISBN 156414710X. This page was last edited on 9 February 2019, at 02:01 (UTC).